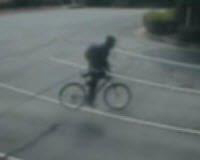 WOODBRIDGE, Va. (AP) — Prince William County Police are looking for a bicyclist who tried to rob a bank by riding to a drive-thru teller speaker and claiming to have a bomb in his backpack. It happened about 10 a.m. Wednesday at the Bank of America in Woodbridge. Police say a man on a bike approached one of the drive-thru speakers and demanded money. Officers say the man indicated that he had a bomb in his backpack. Police say bank employees did not give the man money, and he pedaled away before officers arrived.